Transparency Market Research (TMR) has published a new report titled, “Orthobiologics Market - Global Industry Analysis, Size, Share, Growth, Trends, and Forecast, 2018–2026”. 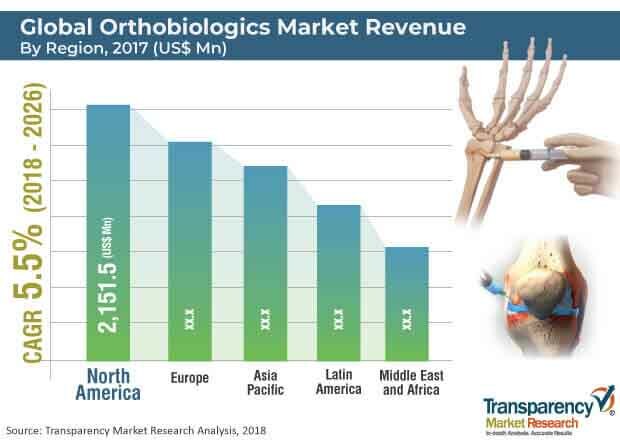 According to the report, the global orthobiologics market was valued at US$ 4.8 Bn in 2017 and is projected expand at a CAGR of 5.5% from 2018 to 2026. High prevalence of sports injuries and arthritis and rise in prevalence of trauma injuries are anticipated to augment the global market between 2018 and 2026. Orthobiologics comprise tissue and bone replacement materials used to expedite healing and recovery of ligaments, tendons, muscles, and bones. Orthobiologics are integral part of orthopedic surgical procedures, as these assist in rapid recovery of joints, bones, and muscles post-surgical procedure and reduce healing time. Orthobiologics comprise products such as synthetic bone substitutes, bone cement, allografts, stem cells, and others. Rise in the global geriatric population increases the prevalence of chronic orthopedic diseases such as arthritis and osteoporosis. Moreover, increase in cases of sports injury and trauma is likely to propel the global orthobiologics market. However, orthobiologics is a new technology and in a nascent stage of adoption. Limited reimbursement support for orthobiologics such as stem cells and allografts is anticipated to restrain the global market. High cost of bone grafts creates difficulty in obtaining reimbursement. Additionally, extensive clinical studies for safety of bone healing products is a constraint for obtaining reimbursement for orthobiologics. Moreover, procedure developed from existing treatment, coding options, and lack of data to differentiate the products are the various reimbursement challenges. This hampers the growth of the global orthobiologics market. The report also provides profiles of leading players operating in the global orthobiologics market. These include Medtronic, DePuy Synthes (Johnson & Johnson), Sanofi, Seikagaku Corporation, Stryker, MTF Biologics, Bioventus, Artthrex, Zimmer Biomet, RTI Surgical, Inc., Alphatec Spine, Inc., Exactech, Inc., Globus Medical, Inc., and Integra LifeSciences. Launch of new products and focus on developing technologically advanced products by companies, and patent approvals are expected to drive the global market during the forecast period. In September 2018, NuVasive, Inc. launched a new product line for Propel DBM. To broaden the product line, the company provided Propel DBM gel and Propel DBM Putty with osteoconductive property which help to promote bone growth. In March 2018, Synergy Biomedical LLC received clearance from Therapeutic Goods Clearance (TGA) in Australia for BioSphere Putty, a synthetic bone graft product that helps bone healing.